Mike Coffman, chief operating officer of Aloha Air Cargo, held up the newly approved Federal Aviation Administration operating certificate at a blessing held yesterday for the company. 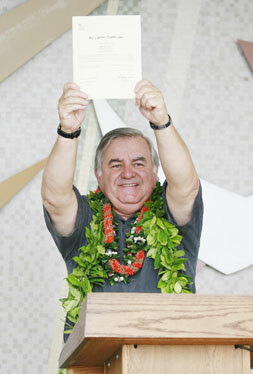 Clutching a federal operating certificate with two hands high above his head, the head of the state's now-largest air cargo company gazed out yesterday at a gathering of employees and officials standing in front of the Aloha Air Cargo building and declared: "We are official." Mike Coffman, chief operating officer of Aloha Air Cargo, received word of the ownership change on the Federal Aviation Administration and U.S. Department of Transportation certificates minutes before a Hawaiian blessing that marked the revitalization of cargo operations in the state. The Saltchuk Resources Inc. subsidiary -- which also owns interisland shipper Young Brothers Ltd. -- took over the cargo assets from Aeko Kula Inc., a temporary holding company formed for the transaction. The $10.5 million acquisition by Seattle-based Saltchuk of Aloha Airlines' last remaining operation kept alive a crucial business that provides 85 percent of the state's air cargo, as well as U.S. mail delivery to Maui and the Big Island. The cargo operation had been on shaky ground since April 28, when it shut down for three days after Aloha's lender, GMAC Commercial Finance LLC, stopped funding the unit. But U.S. Sen. Daniel Inouye's intervention in the form of phone calls to Saltchuk, which had dropped out of the bidding, and to GMAC revived both parties' interest after Inouye said he would help expedite the processing of the operating certificates. "It's just a huge relief at this point for all of these things to come together in such a short period of time," Coffman said. "It was a tireless effort, and I'm not sure what day it is today, but all I remember is the dark day of April 28. But today all of that's gone." Saltchuk Chairman Mark Tabbutt singled out Inouye because "he was the one who made the call to get the conversations going again and get the airline running again and, without him, I don't think we'd be here today." Coffman said approximately 370 former Aloha employees were hired for Aloha Air Cargo, including about 30 pilots, and that the transition should be "absolutely invisible" to customers. "We're pretty much back to the level we had before," Coffman said. "We did have some customer turnover as a result of experimentation with the Superferry, but we'll see how that goes in the future in terms of comparative reliability that we can provide versus what any other competitors can provide."